Just signed up for the forum to ask some build questions!! I'm from Indiana, I have an uncommon 1963 ford 300 (below the base galaxie) with a 223 i6. I have built v8's and love classic engines...I've always wanted to build a six though!! -clifford split header dumping into 2.25" dual exhaust w/magnaflows, h pipe, and hidden turndowns behind the rear bumper. -ford 300 distributor conversion (223 12t timing gear bored out to fit 300 shaft, 5/16" to 1/4" oil drive adaptor fabbed) ditched the terrible load-o-matic dizzy. - 265° Clay Smith bumper /higher lift and duration, designed for torque applications. - fully balance and relieve the motor for smooth revving and ability to stay together up high on a 4 main. Currently the motor has been pulled and is being torn down and hot tanked and fluxed. I'm looking for any advice as we plan this awesome project! Shes sure to surprise a few v8's even in the big 'ol galaxie and sure to turn heads at shows! -Anyone have any tips and tricks that work well for these motors? I've read that they have the same offset combustion chamber that the Y blocks have....and similar valve shrouding issues. Should I be at all concerned with relieving the block/head to try to get the intake velocity up with the bigger valves? - I can find Keith Black Silv-O-lite's for her, but nothing else affordable...any other common off the shelf Sbf or Sbc pistons work in this motor? - any affordable H beam lighter rods that will fit this motor? - what's the best way to about porting the head and getting flow up while retaining velocity needed to make low end torque? I've done my homework to the best of my abilities...not a TON of info on the 223 at all...shes being rebuilt the up coming 2-3 weeks so any info I can pass along to my engine guy would be awesome!! -TONs of sludge...well it's a 223 so nothing new there..
-timing chain shot...1" of slop!! God no wonder I could never get her timed right! So basically the bones are good, no bad scoring on the bearing surfaces etc. Water passages look nice and clean too. He's tanking the block for me today. I spoke with Clay Smith today and they recommended Sealed Power 1011P pistons over the Keith Black ones...can't seem to find anything other than cast For this motor. Unless there's an off the shelf forged that you know of? I called Egge, they didn't have any pistons available for the 223...the guy did say that 254 Y block are close/same. I'm finding conflicting reports on what the stock rocker ratio is on this motor, is it 1.45? I can't find ANY of those baker high lifts. I also just dropped the valve cover, side plate, timing cover, and oil pan off today to get them chrome powder coated...way cheaper than real chrome and will look pretty good when done. I had a set of forged pistons made for my 254 cu in flathead six at Ross Pistons in California. I sent them an old piston and required bore and they went from there. They even provided rings. A little pricey but worth it. Check out their website. They do offer rebuild services for the 215, 223, 262 rockers and can also convert some rocker arms to a Higher Ratio so you might give them a call to see if they can work with you. The 292 and 312 Y Block V8's of certain years (performance versions Like the T Bird engines) also had high ratio rockers arms I never tried adapting them to the 223 but maybe it might be possible. Maybe I can talk to you on the phone though I really don't have much free time since I started working full time again. So I probally can answer your questions faster here on the site. Good luck on your 223 engine and let us know how your doing on it as you can. -rods lightened, relieved (ground casting ribs smooth), new clevite bearings/wrist pins. - rocker assembly was trashed, found a NOS TRW rocker assembly on ebay for $185 delivered. Not bad considering new rockers alone are $240. Unfortunately, Y block rockers are too short to work on the 223 by about 1/2"! -head is being worked, engine guy found a way to make a 2.00" SBC stainless undercut swirl valve to work on the intake, he is going to be turning them down and working the bowls, then doing hardened seats and an angle job. -I found a cloyes heavy duty timing chain/gearset, was going to go with a rollmaster but I dont think ill have any issues with the cloyes HD...should be better than stock. -just won a 292 Y Block flywheel (direct bolt on) on eBay for about $45 shipped, going to run this to have access to 11" clutches and pressure plates. Very limited selection in 9.5." Last thing I need to find is chrome rings for 80 oversize...seems a bit difficult to locate...would one of the formentioned companies you sugguested carry some? My engine guy says that the stock comp. dist of 1.858" should be fine even though we are going to be decking the head/block some. Should I advise him otherwise? When racing my 223 I couldnt keep from breaking the finger pivots of the stock 9 1/2 inch clutches, so often that I then went to a Big Ford truck F500 / F600 flywheel and 11 inch clutch which solved that problem. Some people have used the above 272 Y Block pistions in the 223 by using an early 300 Ford six Conecting Rod too (.912 pin size). Did you actually need to bore Your block out that far over size? If not it might be better to keep hunting for the Pistons in .060 or under oversizes. I don't remember what the stock block height was my best guess is it's around 9.70 inches from the crankshaft center line to block deck, for best accuracy have your machinist check that measurement for you. 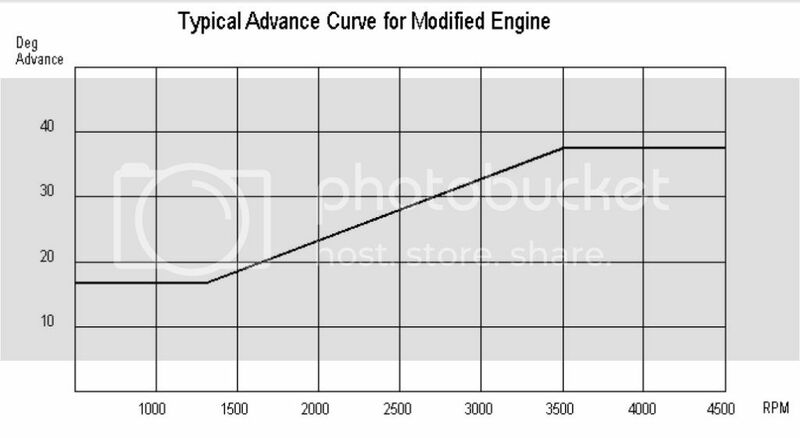 The stock pistion deck height is going to be determined by the pistons compression height distance of 1.858 plus 1/2 the crankshaft stroke of 3.600 (equals 1.550) plus the connecting rod length center to center is (6.258 to 6.262) added togeather is about 9.666 for shortest Rod lenght and up to 9.670 for the longest then this is subtracted from the blocks height to give you the piston top measurement to the top of the block (down the bore). I also think that stock the Pistons are about .025 to .035 down the hole togeather with the steel shim head gaskets being about .020 thick that they used the quench distance was about .040 to .060 but that was a long time ago to remember so I may be wrong on that measurement. Anyway I usally measure what the stock piston top to block deck height measurement is before beginning the engine disassembly to use as a working measurement to go from. Yes the deck height is quite important, in that if you are going to use the new style composite head gasket the Quench distance is then about twice of what is was with the stock steel shim head gaskets that the 223 would of originally had. Yes in my opinion it is better to keep the quench distance tighter now days at .035 to .050 so this is much better then to just cut everthing off the head to get to your desired Compression Ratio. With the typical FelPro Perma Torque head gaskets crush distance at approximately .050 then we would have a minimum deck height for better detonation resistance when raising the compression ratio much over stock. Besides decking the block to attain this you could have also offset ground the crankshaft (Rod throws) to gain a little more stroke length too or also maximizing to Rod lenght too sometimes you can use oversize bushing so they can be all matched in lenght too and as long as possible and this to can keep from needing to deck the block as much. In any case the blocks deck should be trued and squared up so that it is parael to the crank centerline too. If you are to be using a steel or copper head gasket then it's a different story all together on the quench height. Good luck on your 223 build up! Galaxieinline, I was just wondering how your doing on your 223 engine build up? block and head are at the machine shop. Going to have harden seats and new valve guides installed as well as the valve themselves worked. Had three blown rings, two actually came up through the top of the pistons. No damage to the cylinder walls. #4 cylinder is slightly out of round. Going to have the block bored .03 over, re-decked, of course new bearings, the mains honed, crank ground some. Cam looked good. My machine shop has the ability to re-dress the contact surface on the lifters. So we will go back with new plugs, oil pump, bearings, rods, pistons, rings, timing set, lifter rods, valves, valve seats, guides, seals, and gaskets. Well update on the rebuild. Need to sleeve all 6 pistons. What we thought was a motor with 50K original miles actually turned out to be a motor that had been rebuild and bored out .06 over. SOOOOO ... we cross checked the numbers and it is the original motor to the truck, so I decided to save the motor. We are going to sleeve it and bring back to standard. Valve job and new seats on the head, full rebuild kit and sleeving the motor back to standard. More $$ and Time than I expected but it'll be worth it. Keep everyone posted .. and I'll add some pics of the re-install. .060 over isn't all that bad on these thick cylinder wall 223 blocks. Many of the 223 engines back in the day were bored out to .120 over on a rebuild. Call Egge Machine in Santa Fee Springs, California they can make you a set of .080 over (or more) oversize Pistons. Good luck on the rebuild. Project moving a touch slow due to winter and being busy with my business and I promise to keep this updated. I got her all assembled and back in the car, but we had an oil leak at the front of the oan by the timing cover during break in. Out came the motor to address the oil leak...cant find a cork pan gasket anywhere, anybody have a source? All I find are the rubberized paper ones andI cant get them to seal! Im thinking about welding up some threaded holes to put some wideband O2's in each header to help with carb jetting and tuning this spring. Ill post some pictures and some explanation of all the machine work done. Congrats the 223 looks great! Good luck on the tuning. Congrats on the build. Looks great. Ps where did you get that valve cover, it looks taller than the one on the 223 in my 63’ galaxie? I just got my headers back from a friend who works at a large machine ahop and he trued them with a bridgeport. God.....they were HORRIBLE. If anyone is thinking about purchasing headers from Clifford, I would check the flange when they arrive immediately and reject/send them back and ask for a different set if they are as bad as mine were....I had spots that were .050-.100 off!! I never could get a good seal from the get go and had blowouts at cyl # 2,3 & 6. It was obvious that whoever welded mine together at the factory used too much heat on the #6 flange as it was visibly warped inward. Really, for $500 you should get a set of headers that at least seal for a while when you torque them down. Anyway....cold weather and all, I've been finishing the inside of my garage. The header surfacing was one of the last major things I needed to do before I put her back in the car. SO.....anybody have any information on which flywheels and clutches fit in a passenger application? I had assumed that the Y block 11" pattern flywheel would bolt right up (which it did) but I think I have clerance problems with the 11" pressure plate hitting the bellhousing, as I found a rather bad rotary burn mark on the inside of the bellhousing and was having some issues with clutch disengagement. I know the Galaxie/300 in '63 was available with a HD 11" clutch behind the 223 as an option for taxi's and police cars. It was also available in the trucks as a HD option. Im *assuming* the truck bellhousing was different than the car, but am not positive, was the car bell housing different than the 'standard' 9.5" clutch housing? Does anyone have any ford part numbers to cross check this? If you need help finding a clutch http://www.perfectionclutch.com/index.htm They helped me to find a diaphragm clutch that bolted to my 223 flywheel but had the correct splines for the T-18 trans I am running. Just tell them what you have and they will give you a part number that works. Thanks for the advise, perfection was of no help to me. I ended up only being able to squeeze (just BARELY) a 10" B&B style on a re-drilled flywheel. 11" WILL NOT FIT inside the 63 FORD car bell housing! The 11" diaphragm clutch even hit the housing and ground grooves into it/damaged the finger rivets. Once I had the clutch squared away, I finally for her running!! I took it to a local shop that had a dyno and paid for 3 hours. We found the main jets on the weber had to be resized to .055 jets instead of the stock .045. The idle jets needed increased as well to get it to idle correctly. I've come to find out that the "bolt on kit" that clifford sells for this motor is a total joke...it will not run correctly (rich no matter what you do) without changing the jets. Maybe it is a difference in sea level altitude out there? We are at about 700' in Indiana. My timing ended up at 28° at 500rpm and 38° all in with no detonation past 5500rpm. We lost hp either direction so that's where we settled. My AFR is about 12.5-12.7 at idle, 13 or so in the midband. My torque bandwidth was excellent, starting at 800 rpm and not falling off until 5500 rpm. Torque results were a fairly constant 157lbs at the rear wheels....what???? Stock its rated at 205 at the flywheel...shouldn't I be seeing a fair bit more? HP started at about 75hp at the wheels around 1k rpm and peaked at 110 @ 5600rpm and continued to rise, though we dared not take it past that. Again....138hp stock, I'd imagine about 100 rwhp from the factory...tell me that all of my mods weren't only good for 10hp at the wheels? I saw a youtube video of a 58 truck pulling 98hp stock at the rear wheels. Keep in mind this is about a 4000lb car, but the only accessories I have are a water pump and GM 12si alternator and all run through a 3 speed manual. Shouldn't be a huge amount of drivetrain losses. The car does get up and move pretty well after the rebuild, great drivability and torque band, certainly a thousand times better than before....but I cant help but feel that the difference is because the motor was so worn out she might have been lucky to muster 40hp to the ground with the previously weak compression. So whats going on here, thoughts as to why the dyno pull was a lot lower than expected? I was expecting at least 175-200hp and 250lbs or more of torque...but it almost looks like its now putting out about stock numbers! I have just read through all of the hot rodding articles from the 60s posted in the small six forum, and I think your numbers seem pretty good! If a stock ‘67 200 Mustang with manual transmission was putting down 65 rwhp brand new, a 223 would probably have maxed out at 75 tops. You got 110 for at least a 47% increase! That being said, Ak Miller got 125 rwhp at 4800 rpm from a 200 with a compression bump, hotter cam, dual headers, and 4 KeiHin 37mm carbs. I agree that you should be able to see at least that 125 rwhp, probably more, though perhaps not much more—130, 135 maybe? The fact that you were still building power at 5600 rpm seems telling. Perhaps your setup has a higher power peak than you intended. It also seems your Webers are not fully dialed in as your idle mixture is so rich. Others with far more knowledge and experience will surely chime in! Study them and there may be more clues to where the problem lies. One thing I noticed was the huge improvement made by the classic inlines aluminum head alone. Since the 223 has Siamesed intakes for the end cylinders, the flow dynamics to those cylinders compared with 3 and 4 will never be the same. Maybe that is the ultimate hindrance of the 223, at least naturally aspirated. There is certainly a ton of power to be found with forced induction. GalaxieInline wrote: Thanks for the advise, perfection was of no help to me. I ended up only being able to squeeze (just BARELY) a 10" B&B style on a re-drilled flywheel. 11" WILL NOT FIT inside the 63 FORD car bell housing! The 11" diaphragm clutch even hit the housing and ground grooves into it/damaged the finger rivets. Sorry to hear of your disappointment in your 223 rebuild. Ok lets bench race your combo some! Your 1963 Ford 300 with a 223 and 3 speed, engine has a 8.4 to 1 compression Ratio stock and they are factory rated at 138 HP at 4200 RPM and 203 Ft Lbs of torque at 2200 RPM. The car has a curb weight of 3719 Lbs. for a power to weight ratio of 35.9 Lbs. per HP. Stock Performance is 0 to 60 in 15.7 seconds, with a 1/4 mile in 20.2 at 67 MPH, combined city and hyway of 15.1 MPG. The factory HP and Torque are a gross rating at flywheel the engines were tested witout a Radiator, hoses, a water pump, cooling fan, the drive pulleys or belts, no generator, and no exhaust system. It takes as much as 25 to 30 HP to turn those engine accessories and the power that they use can very as engine RPM goes up for the water pump & fan, plus generator or Alternator's electrical load. Add to that that the factory stock exhaust system they used was quite restrictive, back in the day just swapping out the stock muffler for a glass pack noticeably increased the performance as well as the MPG. I will take an educated guess that the installed flywheel HP was closer to 105 to 110 HP Net, the other driveline losses with a manual trans are around 18 % (so another 19 to 20 HP or about 90 HP to the wheels) this chassis / driveline loss can be even more depending on if there are any excessive drivshaft to rear axle piñon angels, brakes dragging, type tires, body height or rake, and if the front end is out of alignment. Also the factory test engines was carefully built to be right on the best possable engine specs whereas generaly the production line engines could vary some especially on the compression ratio with head combustion chambers usally being larger, this is why for class drag racing the engines regardless of brand were blueprinted and carfuly assembled to the best factory specs to get every last HP possable. Have you done any other type of testing to see how your combo compares to these stock performance specs? As for Dyno testing to me it's just a tuning tool the HP numbers being read are not always a good comparison and two identical Dyno's in the same locale area aren't going to give you the same readings. Besides that weather changes can also effect an engines power output too, let alone that some dyno operators can also fudge the numbers some depending on what they may want to accomplish. My first realization of all this was back in 1967 while at a Ford dealers shop they were doing a tune up on a 65 Pontiac Tempest 326 V8 / auto (250 HP rated) it put down a whooping 75 HP to the wheels. My Combo was a 1956 F100 with a 58 223 plus the stock three speed 3:89 rear axel weight was about 3050. As for the 1958 trucks Dyno test, the 223's factory HP ratting peaked in the years 1958 though 1960 at its highest of 145 HP in 1961 and later Ford de tuned the 223 down to 138 HP. As the saying goes you don't race Dyno's, to me the best testing of power output is on the drag strip. I think you are doing fairly good but with more tuning you should do better still. Did the camshaft get degreed? What bearing clearances did you end up with? What did your pistion to block deck clearance end up at? Did the heads combustion chambers get CC'ed? Did the valve bowls get opened up and with the 3 angle valve grind did the valves get back cut? What compression ratio did you end up with? From the few pictures the head ports look to be almost totally stock i.e. Valve guide aren't narrowed or cleaned up of the casting flash. My best guess is you have left a lot of power on the table in the head porting and all important valve bowl work. I also suspect that your compression ratio is on the low side by the amount of timing advance and were the camshaft degreed might not be optimal. I am wondering how much difference there is in your combo versus a stock build. Thanks so much for the replies! Let me be clear: I'm not bitching at all... I think the build was super fun and turned out well enough, I Just want to get the most I can out of my build reasonably. I guess I had kinda forgotten that ford rated their motors without the water pump etc at the factory, but I figured that they would still see about 100hp at the wheels back then....but after hearing what you said I see your point. I'd like to reiterate my expectations for this project so nobody gets the wrong idea here, I don't plan to go racing in an inline six land whale But my expectation for this project was a cool hotrod that turns heads when people hear it or pop the hood...and to give her some "fun" go on the streets, not trying to beat 5.0 mustangs and such. I know that there is a limit to what can be done without forced induction and frankly I don't know that I'd trust a 1950's 4 main tractor motor for long with it. The car is drastically better to drive and keeps up with modern aggressive traffic where I live easily. I'm a bit of a "first from the light" kinda driver even when I'm not trying...spoiled me expects my vehicles to at least keep up with that, which she now does. I regret that I am not old enough to have dealt with Jack Clifford when he was alive, but from speaking with people who knew him he would be rolling over in his grave at how his current company is being handled. Jack was a genius and a well respected man...Larry....well we'll leave it at that. Your comments about the 38/38's being too small for the motor strike me as a little off compared to what I have been told by others. It is my understanding that they are around 380 CFM each for a total of roughly 760cfm. If anything I figured they were a bit on the big side since I'm not going to be regularly spinning to 7k. When I installed the timing set I used a rollmaster Y block set with adjustable crank keys. Idegreed it and every cylinder matched the cam card. Schneider told me if I wanted my power curve to come on earlier to advance 2-4*, so I just put her at +4* figuring it would keep the torque band in the daily driver range. Bearing tolerances: I don't know, the guy who assembled the short block did not provide me with that information at least not in writing. I think he installed everything a hair on the tight side to allow for wear and expansion as he had put it...definitely did not put her together loose for a race motor since we wanted some longevity out of her. Yes, he CC'd the chambers and matched them. He did not write down what the volume was I will have to see if I can get the information from him if he still has it. Stainless undercut swirl valves, 1.910 intake and 1.600 exhaust, both .200 long. interestingly enough it says he only took .030 off the head (!!) when I had asked for .040. He may have taken it off the block as it says that the block has been zero decked as well. On the compression note, clifford performance says with my set up from them and the engine work I should see 320lbs of torque and 260hp. They may be full of horse poo but who knows? At any rate, they achieve this number with supposedly .060 off of the head...perhaps I should take her down another .020? I don't know what the piston to deck measurement is, because again I did not assemble the short block myself. This is all a lesson on what NOT to do next time... now that I have my garage I will be able to do my own assembly. The machinist said his numbers came out to about 9.5-9.7:1 compression. I think it had about 180-190 cranking psi per cylinder, but I will verify what it has this weekend. I had asked my machinist to blend the bowls and smooth the runners, as well as remove the casting flash from the intake runners which it appears he did at least attempt to do...I'm not sure how good of a job he did though as it wasn't quite as clean looking as I'd expect. However, I can attest to the fact that the bowls are a significant bit bigger and more blended than they were before. My cam is supposed to be really close to cliffords grind, Larry flat refused to give me any meaningful numbers over the phone for their cam specs though. He only would provide clues such as 264* duration and "about 455-500 lift." I'm not sure if this is lack of experience or simply being stingy about their "secret rocket science" cam recipe... but after reading about numerous cam failures from improperly ground clifford cams I opted to use Schneider instead, and they had a cam that was supposed to be like the clifford cam. The Schneider card for the 264-F reads as such: .450 lift I and E @ 260 duration. 110LSA & degree intake lobe to 108. I'm starting to wonder if yanking the head this winter and shaving it another .020 and having the bowls worked over by someone who knows a bit more about what they are doing is in order? One final thought on a previous comment made about the power peak possibly being higher than my intended use: Should I indeed go back to the drawing board with the cam? it's not especially lopey or radical sounding, but I cant help but wonder if a slightly smaller cam would bring my power band down some? As always, many thanks to the guys on here who know these motors...we are dealing with a very much lost and dieing artform that I would love to keep alive. P.S. I need to get a video up here of her running, nothing sounds quite like it! GalaxieInline wrote: Thanks so much for the replies! Let me be clear: I'm not bitching at all... I think the build was super fun and turned out well enough, I Just want to get the most I can out of my build reasonably. Thank you for posting all the build details you have it helps in the analyst. There is nothing wrong with having a tighter bearing clearances especially if the primary use is for the street and as long as you let the engine be warmed up good before you really start pushing or hammering it. Plus with use as everthing loosens up it will get faster too. Did you get to see the short block assembled before the head was installed? If it's truely zero decked then that's great and if we knew the head CC's we could get an accurate compression ratio. But if it's really the 9.5 to 9.7 that would be quit decent yet it dosent seam like you have that much compression. Hearing it cranking over would be some confirmation though and so would doing a test of the cranking compression should give some clues too. To be honest compared to Jack Clifford, i don't really know Larry at all and I haven't ever talked to him so can't be very objective. Still there are quite a number of people on this site that claim to have had problems enough to make me bit leary, there are also a number of the site members that knew and delt with Jack Clifford. Still there are only a few places that still make parts for our six'es so I hope he keeps going strong and hopefully discovering & learning. That said glad you got the Schindler Cam over the Clifford's grind (there have been some recent problems with his cam supplier) hope he got that straitened out too. With your power coming on and still rasieing at 5600 RPM and that you can run so much base timing (does the starter kick back any?) I wonder if your cam may need some more tweaking. Maybe even the wrong grind for your purposes since its advanced 4 degrees already, if you can call Jerry at Schinder he will be able to tell you. He can grind a custom cam to fit your needs (its usually about the same price as a off the shelf grind too) or he can regrind yours so that more torque is coming in at a lower RPM to peak at 4500 to 5000 rpm. On the street and the drag strip "Torque is King" and Horse Power takes care of itself! The valve sizes are excellent and since you know the bowls have been worked and blended that's very good and probally is enough. Still I do think there is some room for improvement later on by narrowing the valve guides and blending down further in the port epically on the two Siamese ports transition yet but with out seeing some more or better pictures this is just a guess on my part. I think you can still pull more power out of your current combo with some fine tuning and working with what you have. On the carb's a pair of Holleys will still out perform them, Webers can work very well they just need some work to get them dialed in. I know you probably have quite an investment in that intake & carb's so you will need to stay with it. Take the time to fine tune those Webers there is more power there to be had. ***EDIT*** I'm having trouble uploading photos, I keep getting an error that says "the board attachment quota has been reached". Heres a few photos of the car, we just had a 4th of July parade and she was in it. My right foot got tired! It was 94° out with a heat index of 102° on hot pavement for 1.5 hours idling at 500 rpm down the road...by the end of the parade she had climbed to 220 (normally runs 190) but going down the road for 5 mins cooled her down. It didn't help that it was half a gallon low on coolant either though! BTW, torque on the dyno was flat as a table from about 800rpm or so up to 5400...as far as thats concerned I'm pretty happy with the very broad range it has. Im working on getting a video up here. Its not hard to crank over honestly, never have any kickback and it doesn't have a lumpy turnover with a stock reman bendix motor and a Napa legend 800cca batt. that's one great looking 63 and sounds good too! The gear ratio and 3.03 trans is good combo too. The rated cfm for one Weber 38 DGES with 29 mm venturis is 298 cfm at 1.5" Hg. Same flow per barrel as the 34 ICT/ICH with the 29 mm venturi, 156 cfm each at 1.5" Hg. Two of the 38's would be rated at 596 cfm, same as the 1993-1985 5.0 Mustang 4180C 4-bbl on the 174 to 210 hp Carby GT engines. Generally, the rated CFM is divided by 1.6, and that gives peak potentail net horsepower. Those carbs won't become a restrictor plate untill the 223 makes more than about 373 hp. The carbs were sized for Fords 3 liter 1972-1996 European Essex and 1974-1986 Colgne 2.8 V6's. 138 or 135 hp each. Two of them can shift 270 to 276 hpwith no effort at all. Most of the problems are the needle and seat, which is a very poor design, and needs to be replaced with a better quality 3.0 mm part, with very carefull flaot level set up. Swatson454 on the Jeep formum has all the details. Looks like you got the right wet side to the carbs...Fuel pressure needs to be regulated down, and the bowl vent needs to be clear. Once the jetting is right, then you can focus on the ignition advance.A varified air fuel ratio will be all you need...the ignition is what makes a good Big Six stand up. If it likes 28 degree, then don't be afraid to see if it like less or a lttle more. Before you fiddle with the air fuel ratios, grab a timing light, and re-baseline again the advance curve stuff like cr_bobcat did. A typical curve for a modified I-6 starts off like this. I forgot to look at my vacuum gauge for a couple of measurements. I didn't have time this morning to shut it down and tee into a manifold vacuum source, but do these ported values look healthy or not? It looks like I have about 16/17* of mechanical advance and then about the same 16/17* of vacuum advance. Appears that vacuum starts to kick in at around 1600-1700. Looks like I'm all in, mechanically, at 2000 RPM. I'm wondering if my numbers are a tad off because I've typically heard mechanical to be in the 20-24* range and vacuum to be 12-16*. Do I need to slow down and retake these measurements? Obviously, there is some variability in the measurements since this is me eyeballing something and I can very much see how a Sun machine would help out in tuning these things down to the gnats arse. That being said, I think I will definitely go forward with doing the mods myself until such time as I build up the new engine. With that I think I'll want to eeck every last ounce out of her and will only want to incur the cost of the recurve once. The local guy here doesn't even have his machine at the shop anymore because of lack of use so I may have to be talking to one of you guys to help me out when that time comes. Both Bill the Distrubtor man billythedistributorman@live.com (and especially FalconSedanDelivery, a Supercharged FE engine and Duraspark ignition guru from Freeburg Pa)...these are the guys to chatt with. So I pulled the head off. I am extremely pissed at what I found. My machinist did NOT zero deck the block....the pistons are all .025-.030 in the hole!! With the felpro gasket this gives me a quench height of .080!! No wonder the stinky idle with the overlap my cam has...its not burning thoroughly. I'm going to find a new machinist and have him look the thing over...no telling what else wasn't done correctly. 2 options to fix this....will a stock steel shim gasket get my quench back to the .040 range? The other option is obvious.....pull the motor apart and have the block decked...not friggin fun. The head has already been milled .030, am I safe to take another .030 off the head? I need to measure my chambers next and see what my actual compression is...but I'm guessing its currenly it's in the 7.5-8:1 range...NOT where I needed to be. so you really only got a basic factory type rebuild with a cam swap and a few other parts instead of a full performance build up. Well this can explain quite a few things about the lack of performance you should have had. Yes a steel shim head gasket would help as well as cutting the head. The heads had very thick decks so you can cut them quite a bit depending if anyone else ever cut it before. But getting the quench distance right is the real answer so having the Pistions down the bore is a bigger problem than lower compression ratio you wanted. The performance would be so much better with the deck cut to zero or even with pistions above the deck some (all depending on which head gasket you use) and then adjust the rest of the C.R. by cutting the head. Sorry for your troubles, Do you have any recourse? I have a local guy that machines the blocks for a national celebrity drag racer that is going to help me figure a few things out, other than him no local resources that know six's! But goddammit!! I don't want to pull the motor *again* and tear her all down. $h*t!! Not what I paid for. My paperwork clearly says decked to zero. If zero decked, Do I need to worry about the rods stretching much when they are hot? It is my understanding that a quench height of .045-.035 is desireable. Zeroing the block and using a .015-019 steel shim would get me quench equal to my gasket thickness... wouldn't this be too tight? Wouldn't too tight of quench actually hurt detonation resistance or do I misunderstand? Edit: OH and I've been searching forever and haven't found any results, has anyone CC'd the Chambers on the 60-64 heads so I can get a baseline? My machinist never provided me with the stock or modified numbers...my fault for failing to ask I suppose.